Bulldogs fans cleared the pitch of snow to ensure the game could go ahead. Batley Bulldogs produced a terrific effort but came up just short as they bowed out of the Ladbrokes Challenge Cup 8-4 against full-time outfit Leigh Centurions on a bitterly cold afternoon at Fox’s Biscuits Stadium. Bulldogs supporters had descended on the ground early in the morning to clear the pitch of snow to ensure the game went ahead and their magnificent efforts earned the praise of coach Matt Diskin. Batley threatened to pull of a cup upset and twice in the second half winger Wayne Reittie looked to have grabbed an equalising try only to lose the ball in the act of scoring from two very difficult chances. It was never a cup classic as the game was played out on a heavy pitch and it was the Centurions who scored the only try of the tie, through debutant winger Ricky Bailey as they edged into the fifth round. Playing up the slope in the first half, Batley made a bright start and Patch Walker edged them ahead with an eighth minute penalty goal following a high tackle on Michael Ward. A lovely passing move involving Walker and Dave Scott ended with Lewis Galbraith stabbing the ball into the in-goal area but it was just to far for Jason Crookes to pounce for the try. Walker slotted over a second goal after Leigh were guilty of interference at the play the ball but Batley knocked on at the kick off and Leigh mounted a spell of pressure. A terrific defensive effort kept Leigh at bay but the Centurions forced Batley to drop out and the pressure finally told as the visitors moved left and Bailey stormed down the touchline to score in the corner. Jack Owens landed the touchline goal to edge Leigh ahead. 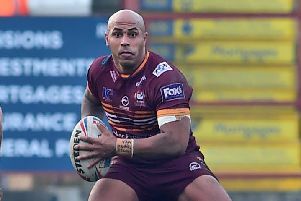 Batley suffered another blow when second row Brad Day was taken from the field for a head test after a tackle on opposite number Bodene Thompson. Batley repelled a further spell of Leigh pressure with Ward, James Harrison and Joe Chandler producing excellent performances and Nathan Mason was flipped onto his back over the try line. Leigh stormed back down the slope but another piece of superb defending saw Thompson held up over the line and Batley only trailed 6-4 at the break. The second half became a slog in the mud as both sides battled to gain the upper hand. Owens slotted over a 60th minute penalty to stretch the lead to four points but Batley threatened to hit back in the final quarter. Danny Cowling produced a fierce tackle which forced Leigh to spill the ball but the chance went begging as Batley were pulled up for a forward pass close to the try line. When Leigh knocked on, Batley kicked to the in-goal area on the free play and Reittie won the race to gather the ball only to lose it under pressure when diving for the line. Batley attacked again and moved right but Reittie was unable to gather a dificult pass as he attempted to cross in the corner. Batley mounted a final attack but Dominic Brambani’s kick rolled dead and Leigh wound down the clock to book their place in the fifth round. Batley Bulldogs: Scott; Reittie, Cowling, Crookes, Galbraith; Walker, Brambani; Rowe, Davey, Ward, Harrison, Day, Chandler. Subs: Hemingway, Brown, Tomlinson, Smeaton. Leigh Centurions: Mata’uita-Leifi; Dawson, Crooks, Evans, Bailey; Owens, Hutchison; Vaivai, Hood, Mason, Lovett, B Thompson, Gregson. Subs: Higham, J Thompson, Dezaria, Hansen.